I sit in the blue chair and read a bit about Gnostic faith in The Nag Hamaradi Scriptures given to me by my son Jay. “Western civilization is rooted in three impulses—reason, faith and gnosis (inner knowing). I like that last one—there is a part of us which “knows”—just because it does. Seems related to the soul. I reflect on those quiet, quickly passing moments when I just know God is there; like when I’ve faced those tests which will tell me if I need open heart surgery or not. God is in it. Whether I need surgery or not doesn’t seem to be the issue. I recall my Dad telling me about his “kitchen experience” the night before his surgery. He felt God’s presence; a great sense of relief and calm, even joy and it had nothing to do with whether he lived or died from the operation. I like these Gnostic writings from Phillip, Thomas, Mary and others. These holy people had unique relationships with Jesus, based less on actions and more on the unspoken, inner life. From the Gospel of Thomas, “Teacher, my mouth is utterly unable to say what you are like.” And Jesus said, “Thomas, I shall give you what no eye has seen, what no ear has heard, what no hand has touched; what has not risen in the human heart.” I believe we each have this gift—this unseen unheard and untouched “strength” for lack of a better word. And we all need it when times are difficult. When have you faced adversity and somehow, you just knew you were going to be alright? Maybe before a big meeting or presentation. Or more seriously, preparing for a conversation with your boss where you have to convince him or her that a program you headed was successful. Or even a discussion where you knew you were losing your position. You did all the right things beforehand e.g. accomplished thorough research; compiled evidence with bulleted points at your fingertips; and prepared cogent, concise arguments. Confidence results from this preparation. But you needed more. “Inner knowing” sometimes just manifests itself. Call it strength or maybe grace. Possibly chalk it up to years of working and praying your faith. It’s the fruit of your labors. And it makes all the difference that no matter what happens, you will be alright. Think of the ways you prepare for adversity. And when you make it through, how much was due to your preparation? And how much was because of something deeper and less known? *This TranSpirations focuses on the relationship between Tom’s journaling about his successful heart surgery in 2008 and possible lessons for career/work/retirement transitions. President of the Board and Executive Director for The Center for Life Transitions. 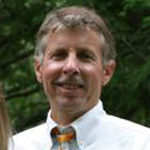 Tom is responsible for overall Center leadership and strategy. His individual coaching/counseling as well as workshops and retreats focus on integrating leading career development ideas with spiritual exploration. Read more.